S5 to SuperStar Visualization Process? I'm not sure if this is the right forum, so apologies if I have this in the wrong forum. End Goal: Get a "visualization" into SuperStar to sequence a number of RGB props using S5 beta software. I have been learning SuperStar (v5) by sequencing a single prop (a 16-ribbon CCR tree), which was easy to set up in SuperStar without anything from S5. Now I want to add arches (4), multiple rooflines, and the aforementioned 16-ribbon CCR pixel tree. Being new to Christmas lights, I started designing with RGB pixels and S5 beta software from the beginning bypassing pre-S5 software. With S5, I understand that one must design their props in a Preview prior to performing any sequencing activities in S5. I understand that concept (e.g. I believe this creates a visualization by design, and I have added pictures of my house to make the preview ("visualization") realistic). I have run into 2 problems, and I'm not sure how to get around them. Problem #1: I cannot get my house in one picture. I have not been successful "Photoshop-ing" multiple pictures together. From my research, many folks used the previous non-S5 Visualizer to make multiple "viz" files with their props defined, and import them (as in multiple viz files) into SuperStar, sequence them accordingly, and export each completed SuperStar sequence into the non-S5 Sequencer, created a "master" sequence in the process (layering I guess?). I wanted to perform the same process using S5 software. Can I do this? Is my thinking incorrect? Problem #2: I am completely missing how to create the equivalent "viz" file with S5 to import into SuperStar to perform the tasks in Problem #1 above. SuperStar insists on importing "viz" files (files with a .lee file type). Could someone please explain how I can accomplish the end goal of getting multiple "viz" files into SuperStar so I can sequence them, and ultimately export back into S5 for a final sequence? What is the equivalent in S5 with the prior non-S5 process? Sort of useless. A month or so ago, I spent hours re-creating from scratch in S5 most of my display, carefully following all of Matt's instructions. The intent was to be able to export the entirety of my display all at once to SuperStar. The result was a grid in SuperStar with four boxes. Totally useless for an 6,000 channel display! In full disclosure, once I got close to opening my Christmas display, I stopped doing any playing with S5, so I think it was 5.0.8 that I last used. There have been several updates since then. Shortly after the new year, I will install S5 on my sequencing computer and give it a serious go. I really would like to be able to add a few Pixel Editor effects once in a while, but still expect that almost all of my sequencing will be in SuperStar. So I really do hope that the SuperStar integration happens in a useful form. If I have to do it one prop at at time in order to use SuperStar, I will be staying with S4. Congratulations! You have just found the largest (in my opinion) limitation with S5 and SuperStar. There is no way to do it. At least not yet. Well, that is unfortunate. While researching and learning about Christmas displays and LOR products in particular, I frequently refer to the LOR-produced PDF documentation describing the S5 software release. One section of the documentation noted that there was "tighter" integration between the Sequencer, Visualizer, Pixel Editor -and- SuperStar. This would seem to be removing prior functionality that existed between S4 Visualizer and v4 SuperStar - thus less integration as opposed to tighter integration. Perhaps Brian Bruderer can comment on this situation. A question comes to mind - is SuperStar intended only to sequence RGB pixels that are in a matrixed prop? Should we not attempt to sequence RGB pixels (CCR ribbons) such as roof lines and arches with SuperStar and instead utilize the S5 Pixel Editor? Or the S5 Sequencer (is that even possible - I thought that the S5 Sequencer was only intended for traditional lights and "dumb" pixels)? My research showed that many folks simply used SuperStar to sequence all of their RGB (smart) pixel props, thus using one tool instead of several. This approach appealed to me. I would appreciate alternative suggestions by Mr. Bruderer and/or Mike/LOR Developer(s) on how to proceed. Rather than starting a new thread, I'll add to this thread. Brian, in this thread LOR Hardware - PIXIE4 Post, I was asking about the LOR Gen 2 Pixie controllers (Pixie 4, 8 and 16) and whether they can support a WS2811 60m/20m ribbon. This is a 100 pixel ribbon versus a standard WS2811 30m/10m 50 pixel ribbon (you can see some additional context to my question here). Along the same lines, I was asking whether SuperStar (v5.0.16) can "natively" support a WS2811 60m/20m ribbon. I have been happily sequencing a 16 CCR string at the "standard" density of 30m/10m (50 pixels). LOR sells a CCR II 100 pixel count CCP and CCB node strings. This would necessitate a grid length of 100 pixels versus 50 pixels. I was playing around with the Layout function, and did not seem to be able to generate a grid with a length greater than 50 pixels. I am in the stages of building a 16 CCR ribbon pixel tree, and was reconsidering utilizing a WS2811 ribbon density of 60m/20m versus the "standard" 30m/10m ribbon density pixel strings. Does/can SuperStar support a 16 CCR pixel tree but at a "native" density of 60m/20m (100 pixels, 300 channels)? If yes, how do I do that? With SuperStar in Visualization mode, you can do almost anything. More when I get to a computer. I've only used SuperStar CCR Mode and not Visualization mode. Ready to learn the difference(s)! Can you PM me a phone number and when you’re available. SuperStar is not limited to just matrixed prop. I use SuperStar to sequence all kinds of props. More than 90% of my pixels are not in a matrix. I have rooflines, windows, yard edges, four mini trees, and some arches. I sequence all of them in one large SuperStar sequencing grid, laid out in the grid exactly as I specified in Visualizer (in other words, don't use the default). Actually just the opposite. SuperStar is quite adept at sequencing any part of your display, whereas Pixel Editor is far more limited to matrix type things. With S5, yes there is better integration between Sequence Editor and Pixel editor with the new S5 sequencer, but so far (better promised) very poor integration with SuperStar. I sequence every channel in my display with SuperStar. The only part that could be considered a matrix type element is my 12 x 50 pixel tree. That leaves almost 4,000 channels that are in no way a matrix type element. SuperStar sequences then all with ease. Although I do sequence my whole display in SS, in a world where you used each software to the best of it abilities, I think SS is more designed to matrix type props and the pixel editor or now the grid would be better suited for roof lines and such things. I personalty just like to knock it all out in one software and then add some finishing touches in the editor. If they added morphs and shockwave effects to the editor would be icing on the cake. Doug, I respect your opinion , but strongly disagree with it. For the rest of this I am going to use S4 terminology to segregate the pieces of software except as specifically stated. For the non-matrix stuff, going back from SuperStar to Sequence Editor is a huge step backwards. And Pixel Editor for the most part can't sequence non-matrix stuff at all. Combining Sequence Editor and Pixel Editor into the new S5 Sequencer does not make either any better other than it being easier to move from one to the other. Yes, there a few new features in the S5 Sequencer but nothing that is overly revolutionary. On the other hand it specifically IS the ability to sequence non-matrix stuff in SuperStar that makes it so valuable (and why the current “Insert SuperStar effects” in the new S5 Sequencer is so badly neutered). For example start with a morph on a matrix (pixel tree in my example). Copy and paste that morph and change the endpoints to one or more arches, or roofline, or eves, or candy canes, etc. Within seconds that same color pattern and timing have been applied to several other parts of the display (or maybe shift the color or timing a little). A true matrix would be some number of rows of pixels. For example 24 rows of 50 pixels forming a rectangle that has a pixel every two inches (for example) in both the horizontal and vertical axis..There are some other props that also are at least matrixish. For example a pixel tree is often 12 or 16 vertical strings of 50 pixels. Although tapered towards the top, you can do graphics and text on it fairly well. What I mean by non-matrix props is most everything else. Examples in my yard are individual lights (either RGB or single color), strips or strings of dumb RGB lights, strings of traditional l.ights, strings of pixels in a row (roofline for example), candy canes, singing faces (can be done on a matrix, but I'm talking about traditional string based faces). Yes makes sense.. That you for the clarification.. I just started learning Superstar to program the mega tree I just got 16 strands of 50 nodes.. Im just searching the forums trying to learn as much as I can.. Last year I used LOR pixel editor for all my RGB nodes and really like it, but everyone seems to say I need SS for a mega tree.. I wish I could mixed SS effects and pixel editor effects on the same prop in the same sequence, not sure if that's possible.. Anyway thank you so much again for your time and help.. 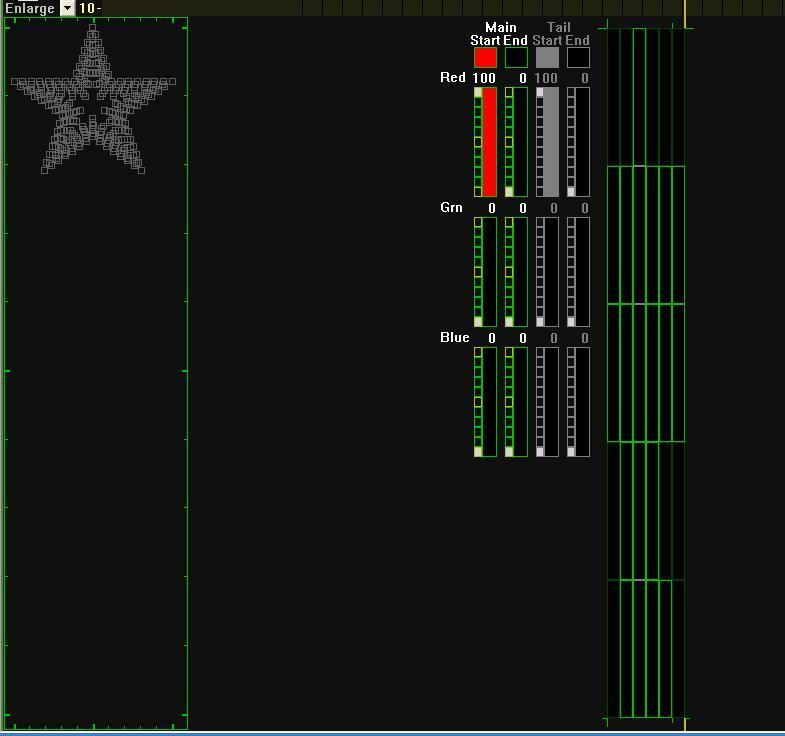 Personally I MUCH prefer SuperStar over Pixel Editor, but either can program a pixel tree. in S5 it is FAR easier to mix effects fro PE and SS in the same prop and song.